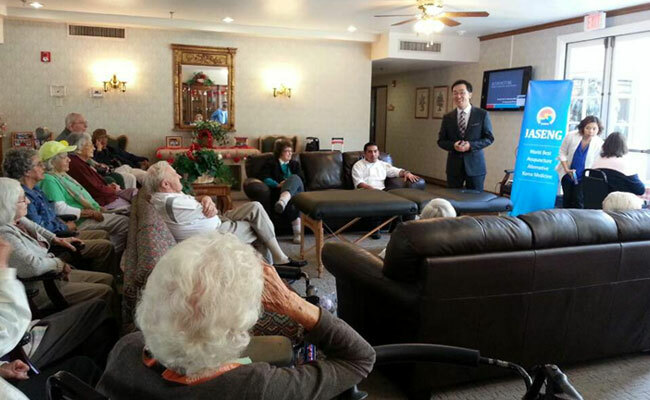 On February 19, Dr. Winston Lee, the representative of Jaseng US network had visited Sunnycrest Senior Living in Fullerton to give a health seminar on spinal and joint disorders. This health seminar was arranged by a patient from Sunnycrest Senior Living that receives Jaseng treatments for his knee pain. It was a meaningful time for both Jaseng and the seniors, being able to introduce and be exposed to Korean medicine. The seminar was based on preventing spinal and joint disorders and effectiveness and safeness of acupuncture. One senior who had shoulder pain had a chance to experience acupuncture treatment during the seminar. The seniors in attendance showed their interest regarding safeness and no side effect aspect of Korean medicine treatment. Dr. Lee wishes to develop the relationship with Sunnycrest Senior Living by continuous visit and providing medical care to spread the excellence of Korean medicine.